Whilst Perth, Australia may not be spoken of by us East Coast Aussies as having a thriving rock scene, with the tyranny of distance involved, I guess we have to put that down to perhaps our own ignorance and failure to explore what Perth has to offer as far as a rock scene. 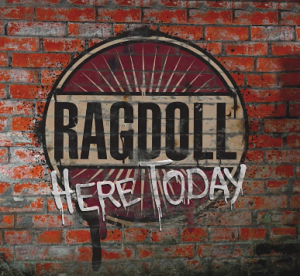 I guess we can’t argue with the history, I mean a wee little Scotsman named Bon Scott kicked around those parts and there’s been much other goodness in the past…but that’s all history and here in 2012, we are here to talk about Perth hard rock trio Ragdoll and their second EP Here Today. I haven’t heard their first EP and not being totally familiar with these guys prior to receiving this EP, I was probably initially influenced by the band name Ragdoll and expected a sleazy, glam fuelled sound. But whilst there are very slight tinges of this, Ragdoll deliver a more traditional hard rock sound that draws influence from the classics of the 70’s and 80’s and wraps them up into what is a pretty killer EP to say the least. Title track Here Today blasts out of the blocks with some bombastic guitar riffs and a chorus that prompts me to liken it to the band Extreme who have that undefinable “something” in their sound, song delivery and arrangements. Tell Me has a real stomping classic rock vibe and it’s gotta be said, Rydash has some pretty impressive chops as a rock vocalist to say the least, which leads nicely into the next track, Could It Be Love. Whilst I’m not elevating his vocals into the same league as the late, great Steve Lee of Gotthard who is in a class of his own, Could It Be Love, wow this is like one of the best ballads that Gotthard never wrote, a simply killer song this one. Heaven Above is a 7 minute opus that puts the bands capabilities as musicians well and truly on show, with a 3 minute outro from guitarist Leon Todd. EP closer Overnight Sensation has just a little has more in common with the bluesier hard rock of Firehouse than simply just sharing a similar song title, and that’s a wrap for this EP. The selfish part of me wants to enjoy more, far more from these guys than simply a 5 track EP, but hey if Here Today is a statement to the rest of the world of what hard rock bands in Australia are capable of, then I’m more than happy for Ragdoll to join those already out there flying that flag. As they did just recently in the USA at Rocklahoma Festival. Hopefully an East Coast Australia tour awaits soon!